Most living organisms are composed of several cells, but are these cells irregular or disordered? Does each of them work separately from the other? Cells are specialised in their functions. Each group of specialised cells forms what is known as a tissue. For example, the heart’s muscular cells are arranged to form the muscular tissue of the heart wall. If the cells forming the tissue are symmetrical with each other in terms of shape, structure, and function, then the tissue is called a simple tissue. If the tissue is composed of more than one type of cell, then it is called a compound tissue. Types of tissues vary in regards to the differences and diversity of living organisms, as do the activities and vital functions of the tissues. In most living organisms, the tissues are organized into groups called organs. Each organ is a group of tissues working in harmony to perform certain functions. Such tissues and organs are present in both plants and animals. For example, the heart is an organ in multicellular organisms such as humans. It is mainly composed of heart muscular tissue, nerves, and connective tissue. The heart muscles, nerves, and connective tissue collaborate together to pump the blood from the heart to all parts of the body. Groups of organs working together form what is known as a system. 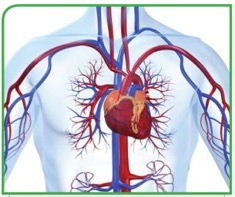 The heart, blood and blood vessels form the circulatory system of humans. Systems organise and integrate together to form the whole body of the organism. The human body is composed of several systems besides the circulatory system, such as the skeletal system, muscular system, nervous system, digestive system, respiratory system, excretory system , reproductive system and so on. Plant tissues can be divided into two groups: simple and compound tissues. The cells of parenchyma tissues are oval or round shaped. Their walls are soft and elastic and contain spaces among them for aeration. The parenchyma tissue performs several functions, such as photosynthesis, storing nutrients such as starch, and is responsible for aeration. The collenchyma tissue is a soft tissue. It is a living tissue and its cells are rectangular-shaped. Its walls are irregularly thickened with cellulose. This tissue helps to support the plants by giving them elasticity. The sclerenchyma tissue is a solid tissue. It is a non-living tissue. The cells of these tissues are thickened by a substance called lignin, in addition to cellulose. It also strengthens and supports the plant, giving it elasticity and hardness. Examples of complex tissues in plants are vascular tissues and conductive tissues. They are divided into two types: xylem and phloem. Their function is transport (conduct). Xylem is composed of vessels, tracheids and parenchyma cells. 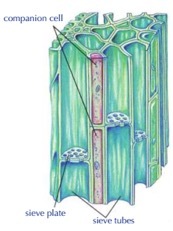 Xylem vessels are tubes. Each of them is made up of a vertical row of cells from when the protoplasm and transverse walls disappeared, and lignin precipitated on the inner surface, changing the cells into long, wide vessels through which water and salts are transported. The vessels’ length ranges from a few centimeters to several meters. Each tracheid is composed of one cell, in which protoplasm has disappeared and its walls have been lignified. Xylem is specialised for transporting water and salts from the roots to the leaves in addition to supporting the plant. These sieve tubes result from cells being compacted vertically above each other when their nuclei vanished and the separating walls became perforated. They are called sieve tubes because the cytoplasm passes through in the form of cytoplasmic strands. The sieve tubes are adjacent to companion cells which provide the sieve tubes with the energy required to perform their functions. The phloem transports the nutrients resulted from photosynthesis from the leaves to the other parts of the plant. These are the tissues that cover the outer surfaces of the body and that line the body’s internal cavities. 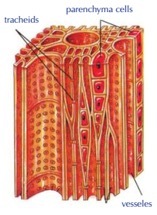 The epithelial tissue is composed of a great number of closely adjacent cells, connected by an interstitial substance. Simple squamous tissue: this is composed of one layer of flattened cells, such as the endothelium of blood capillaries and the walls the alveoli in the lungs. Simple cuboidal tissue: this is composed of one layer of cuboidal cells, such as the lining of the kidneys’ tubules. Simple columnar tissue: this is composed of one layer of columnar cells, such as the lining of the stomach and the intestines. Stratified squamous tissue: this is made up of several layers of compact cells on top of each other. The surface layer of this tissue is squamous, such as the skin epidermis. The epithelial tissues perform different functions with respect to their sites. They absorb water and digested food in the lining of the digestive canal. They protect the cells from drought and pathogens in the skin epidermis. They secrete the mucus that makes cavities smooth in the digestive canal and the trachea. Connective tissue proper – this is the most widely spread type. It ranges between being fairly solid and quite elastic. The main function of this tissue is to bind the different tissues and systems of the body with each other. This type is present under the skin and in the mesenteries. Skeletal connective tissue – this includes the bones and cartilages. It contains a solid intercellular substance in which calcium precipitates, such as the bones. Its basic function is the supporting of the body. Vascular connective tissue – this includes the blood and lymph. It contains a fluid, intercellular substance. Its basic function is to transport digested food and excretory substances. 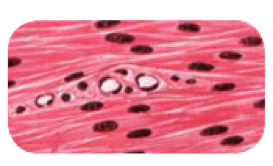 Smooth muscles – these are composed of unstriated, involuntary muscle fibers. They are present in the walls of viscera, such as the wall of digestive canal, urinary bladder and blood vessels. Skeletal muscles – these are composed of striated voluntary muscle fibers. They are usually connected with the skeleton, such as the muscles in the arms, legs, and trunk. Cardiac muscles – these are composed of striated involuntary muscle fibers and are only present in the heart wall. They contain special parts, called intercalated discs, that bind the muscle fibers together and make the heart beat in a rhythmic way and as a functional unit. The cells of nervous tissues specialise in receiving sensory stimuli, whether they are internal or external to the body, and connect to the brain and the spinal cord. They transmit the motor impulses to the effector organs (muscles or glands).